Sample EcoTypes report extract; click to expand. When you complete the EcoTypes survey, you will receive a customized report via email, generally within 24 hours of submitting the survey. Make sure to save it! Your instructor may ask you to bring a copy to class, so that you can compare your results with those of others. At right is some help in interpreting the graphic in your EcoTypes report. 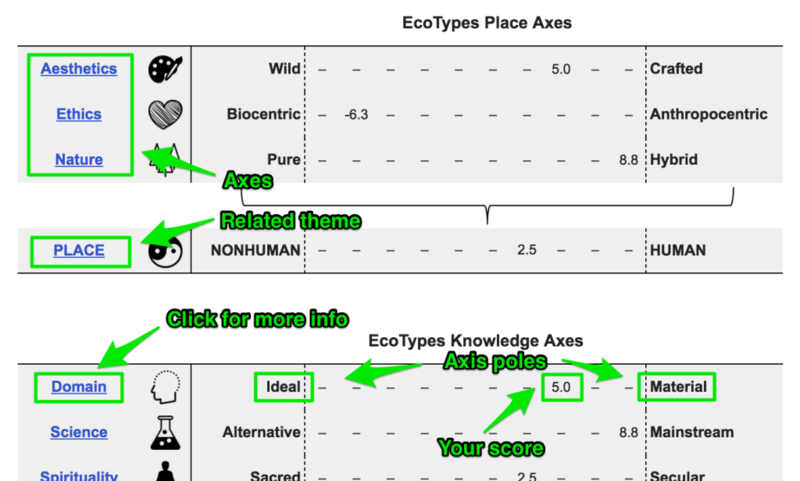 As you can see, the EcoTypes axes are bundled into their related themes, and your summary theme score is immediately below the axis scores. For each axis (and theme), you’ll see your score placed appropriately between the two axis poles. If you want more information on any axis or theme, just click the link at left. Below is text you will receive with your emailed report to help you interpret it; it will include links to resources on this site. Date/time survey completed (U.S. Pacific Time): [date] [time]. Thank you for recently completing our EcoTypes survey. Here is your personalized report, calculated from your responses. If you’d like more information to better understand this report or the EcoTypes initiative, go to the EcoTypes website. You responded to four statements from each of fourteen EcoTypes axes. Most of these axes are bundled into three main EcoTypes themes below. You’ll see your average scores, from -10 to +10, with negative values suggesting greater affinity to the left pole, and vice versa. What sorts of patterns in your environmental ideas emerge from these summary values? We also calculated an EcoTypes polarity score for you: higher polarity scores (roughly 3 or greater) mean that your axis responses were more toward the right or left poles; thus you expressed stronger views overall than others. Like your axis responses, this is neither good nor bad but provides opportunities for reflection and comparison. Here’s your polarity score: [score]. Below your EcoTypes tables is a table summarizing your average response to grid-group cultural theory items. What do these summary values say about you? Do you believe you match the grid-group type assigned to you below? How may it relate to your EcoTypes axis and theme scores? For more information on grid-group theory, see the EcoTypes page. Make sure to save this email so that you can compare your score to those of other respondents in your class or on the EcoTypes website. You may also be asked to retake this survey at some point in future to see if your responses changed at all, so you’ll need to compare the two email reports. If any questions, feel free to email the EcoTypes initiative director, Prof. Jim Proctor of Lewis & Clark College (jproctor@lclark.edu). Thanks again for completing the survey!